With this brooch you can make all your attires look elegant. This tulip brooch is made with quality cubic zircon and simulated diamond embedded all over the beautiful piece of jewelry. Simple circle theme with cz tulip blossom; leaves are cubic zircon & silver metal filigree pin [brooch] so popular around 1960s. Picture this lovely brooch on your favorite dress shirt scarf or jacket lapel. Beautiful accessories for any occasion. Secures with a standard pin clasp. A great holiday gift set or an addition to your jewelry box. An absolutely gorgeous vintage brooch. This item in Bridal Accessories category was first added to our catalog on 10-24-2013. 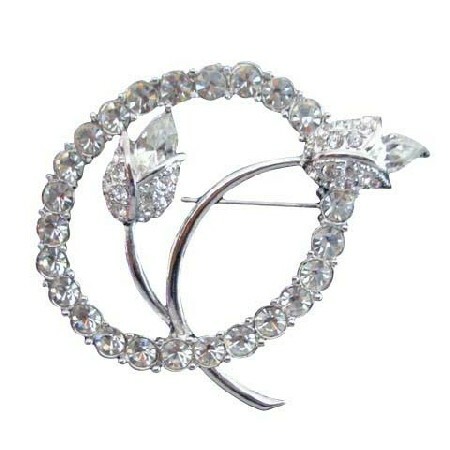 Buy Vintage Tulip Brooch Pin w/ Simulated Diamond In Circle, sold & shipped by Fashion Jewelry For Everyone where you can shop online for Leading Online Retailer for Indian Fashion Jewelry. This Bridal collection has been tagged as brooch, pins, cake decoration, bridal.